Exactly how important is HTTP 2 support (and by extension, Servlet 4 support to make it happen) for Java EE? Our survey says devs think it's pretty important. As some of you are aware, the Java EE Guardians and DZone jointly conducted a community survey to help determine Java EE 8 features prior to JavaOne 2016. You may also be aware that we shared the results of that survey with Oracle before the details of the renewed Java EE 8 scope was announced. Now is a great time to start analyzing those results a bit more. I've already done a high-level summary of the results. In this entry, I'll dig specifically into the responses for HTTP/2 and Servlet 4 support in Java EE 8. "The much awaited HTTP/2 standard is now complete, was fifteen years in the making and promises to radically speed up the entire web through a series of fundamental protocol optimizations. Servlet 4 is the primary vehicle to bring HTTP/2 to server-side Java. Beyond Servlet 4, higher level server-side Java web frameworks like JSF can also take advantage of HTTP/2 to significantly improve performance. How important is it to bring HTTP/2 support to Java EE?" The following graphic shows how the community responded. Clearly, developers think HTTP/2 support and Servlet 4 are important for Java EE 8. 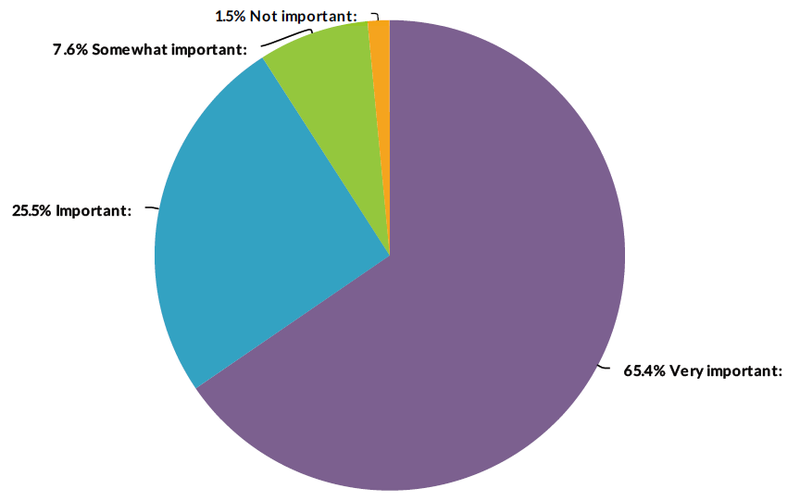 65% said it is very important while 25% said it is very important. A mere 1% said it is not important. If you want to learn a bit more about HTTP/2 and Servlet 4, please do feel free to check out my slide deck or screencast on the topic. While it is possible for server implementations to provide some level of HTTP/2 support without Servlet 4, things like server push can only be provided in a manner that developers and framework writers can rely on through Servlet 4. In addition, the Servlet 4 TCK is the only third party verification mechanism that a server actually implements HTTP/2 correctly. Unsurprisingly, the results for Oracle's own Java EE 8/9 survey basically mirrors what the DZone/Java EE Guardians survey indicates. The graphic below shows the results of the Oracle survey. Just as in our survey, Servlet 4 is one the APIs that has the strongest support amongst all Java EE 8/9 features. Here are some representative comments from participants in the order that people filled in the survey: "Servlet 4 and HTTP/2 are probably the most important parts of Java EE 8", "Very important as there are a lot of improvements in HTTP/2, it is the future", "I cannot imagine the next iteration of any serious web-based standard or framework not to take (full) advantage of this advance in the underlying technology", "HTTP/2 is a big step towards faster communications and applications", "HTTP/2 is the future of the web", "I develop web applications with JSF, so yes this is very important", "Clearly more than very important". Oracle has recommitted to delivering Servlet 4 by the end of this year or sooner. Although the Oracle specification leads have clearly re-engaged in Servlet 4, progress still lags behind some other Java EE 8 JSRs. That said work on Servlet 4 is visibly spinning up as I am writing this.